Day 128 / Hat 128: Red plastic firefighter's helmet with white badge detail on front that reads: "Junior Firefighter Skywalker Fire Department," and yellow badge detail on the back. Project Cubbins has gained enough traction that some really cool hats are making their way to me -- and this hat is a perfect example. It is on limited loan (and when I say limited I mean like five minutes tops) from the Family Boucher (mom Tracy works within earshot of me, dad Geoff is a former LAT colleague whose various projects and pieces make him the hands-down Alpha Dad of the "Guess what my father does?" conversation). Tracy told me that the hats are the kind of memento a kid might get after visiting George Lucas' Skywalker Ranch in Marin County, California -- as their kids when the family made the visit to the 5,156 acre spread in 2008 while Geoff was working on an LAT magazine piece about the place (there's a link to the story below). 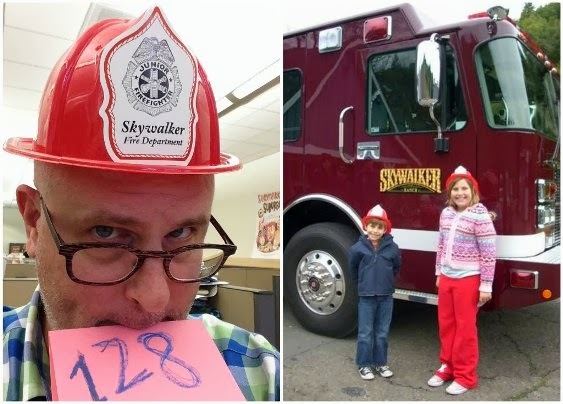 "The Skywalker firefighters do more than put out brush fires; they handle overnight guest services for lodgers at the inn, and they often zip guests up to the Main House or Technical Building in one of their smaller trucks." But the most tantalizing factoid Boucher drops about the place - at least as it pertains to the Project - is the iconic piece of cinema headgear that is part of the Skywalker Ranch holdings: Indiana Jones' hat.